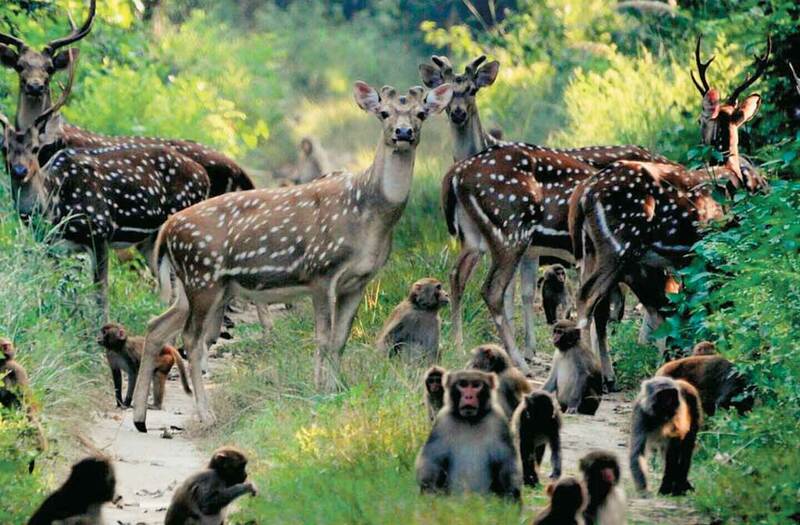 The Dudhwa National Park is located on the border of the Uttar Pradesh and Nepal. It is located on the state highway 90. In 1985, it was recognized as a park. It is the best place for the adventure loving people. The park has a dense forest and colorful grassland. The park is located in an area of around 811 km square. The park is the home place for many species and many wildlife animals. This park is famous for its Tigers, Barasingha, deep and many other rare animals as well. The visitors can also view the hispid hare, leopard, rhinoceros and many others as well. It also has a huge range of bird species. It is more than 350 species. It also has a vulture of White-rumped, which is rarely found anywhere. It is the best place for the bird lovers. Earlier the park was the home for the deer. In 1977, Arjan Singh the famous hunter renamed this park. He also added many species in the park including tigers and leopards. It was declared as a project for reserving tigers in 1987. There are many things to enjoy in this park for the tourists. There is a jungle safari for the tourists. It is the first thing to do in the park for viewing the variety of wild animals and enjoying the beauty of India. You can also view the rarest wild animals in the park-like Barasingha. The visitors can hire the bus or jeep safari that is certified by the agencies. The visitors can also enjoy the elephant riding. The bird lovers can enjoy the different species of birds. It is better to take binoculars along with you. The visitors can also enjoy the camping in the jungle with bonfire and night beauty of stars. There is also a small town Palia near this park. There is a small market for shopping handcrafted goods. The park also has a canteen where the visitors can enjoy the pure vegetarian food. The entry fee in the park is Rs 50 for the Indians and Rs 300 for the Foreigner. The authorized safari vehicles charges in the park are Rs 1000. The park remains open for all days of the week. The opening time is from 7 AM to 10 AM and from 3 PM to 6 PM. The best month to visit this park is from December to May. Every Year, it remains open from 15th November to 15th June. The nearest airport is in Lucknow. It is just 230 km away from the Dudhwa. The tourists can hire a cab or taxi from the airport to the park. The nearest railway station is in Dudhwa. It is just 4 km away from the park. There is also bus or cab facility from the main cities.